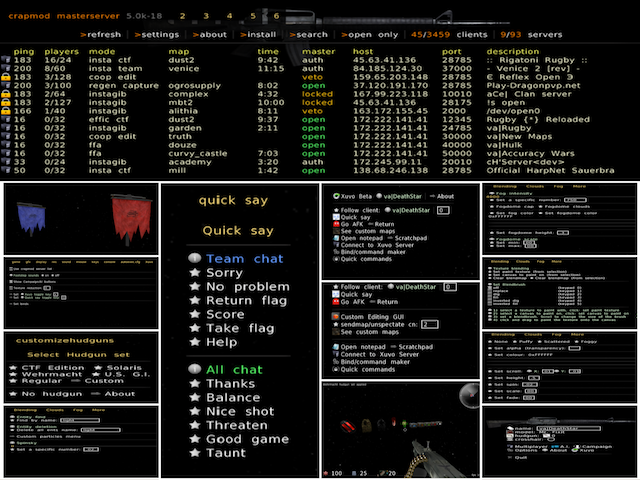 This is a mod for Cube 2: Sauerbraten (http://sauerbraten.org/), a free first person shooter that has a multiplayer co-operative editing mode and more than 15 different gamemodes to choose from. It was made a long time ago and has old hud. This mod aims to update the game and make all of the features it has hidden under its hood accessible through a graphical user interface. With Xuvo, you can easily toggle footstep sounds, search the master server list for your friends and servers, edit heightmapping and texture blending all from a graphical user interface. Select a new set of guns from the hudgun selector, right next to where you select a crosshair and your name. Send a message periodically during your AFK period, easily make binds and commands on your own without even having to leave the game. Blend textures, heightmap in multiplayer, add fog, clouds, skyboxes, etc. Simply add the files in place of your pre-existing gamedata folder and be done with the install. - Interactive hudgun GUI: more than 4 interchangeable hudgun sets to select or add and select a new quadropolis hudgun pack. Xuvo campaign/AI buttons gone: goto options>Xuvo and enable "show campaign/ai buttons." Xuvo GUI Not opening: you must be connected for the GUI to open. Xuvo Editing GUI not working: you must be in coop edit mode. Xuvo footstep sounds not working: you must turn them on in options>Xuvo. Crapmod "master server not responding": you have an outdated version of Xuvo, re-download Xuvo with the same link you downloaded it from before as it has been updated and the new crapmod masterserver has been added. To disable crapmod, goto options>Xuvo and uncheck "use crapmod server list."